When I was seven years old the sound of an ice cream truck used to stop me dead in my tracks. The melodic chimes would send my pals and I into a mad frenzy, scurrying to find some money, any money, that would allow us to partake in this summer ritual. Many years later, not much has changed. My iPhone rings out with a tweet from The Merry Dairy ice cream truck signalling its arrival. The promise of ice cream still elicits the same sweaty palms, increased heart rate and mad dash to find cash. Merry Dairy doesn’t serve run-of-the-mill ice cream. 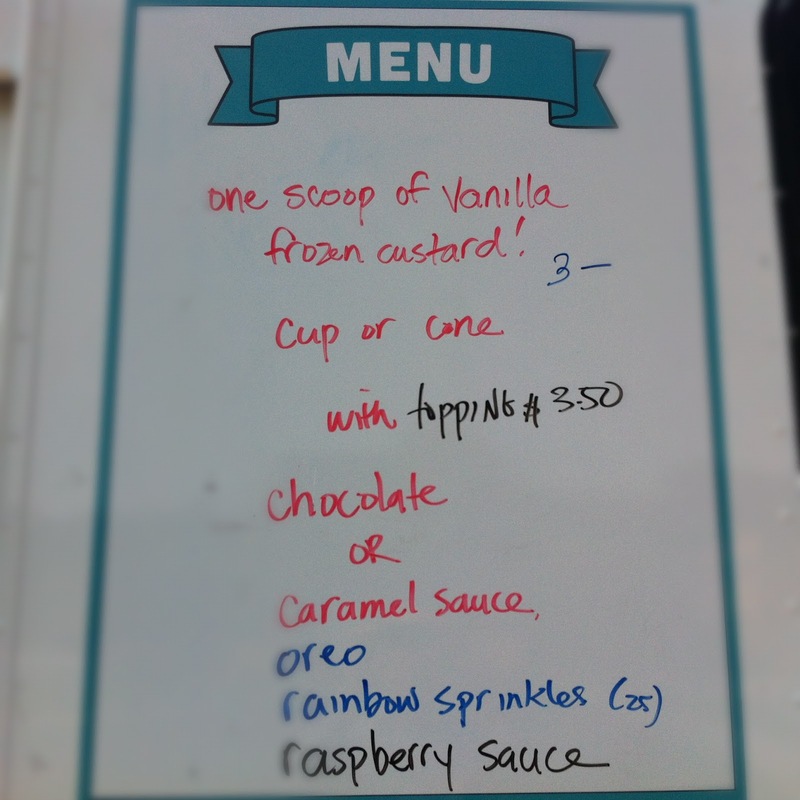 It dishes out frozen custard. According to its website, frozen custard was invented in Coney Island, New York in the 1920s. 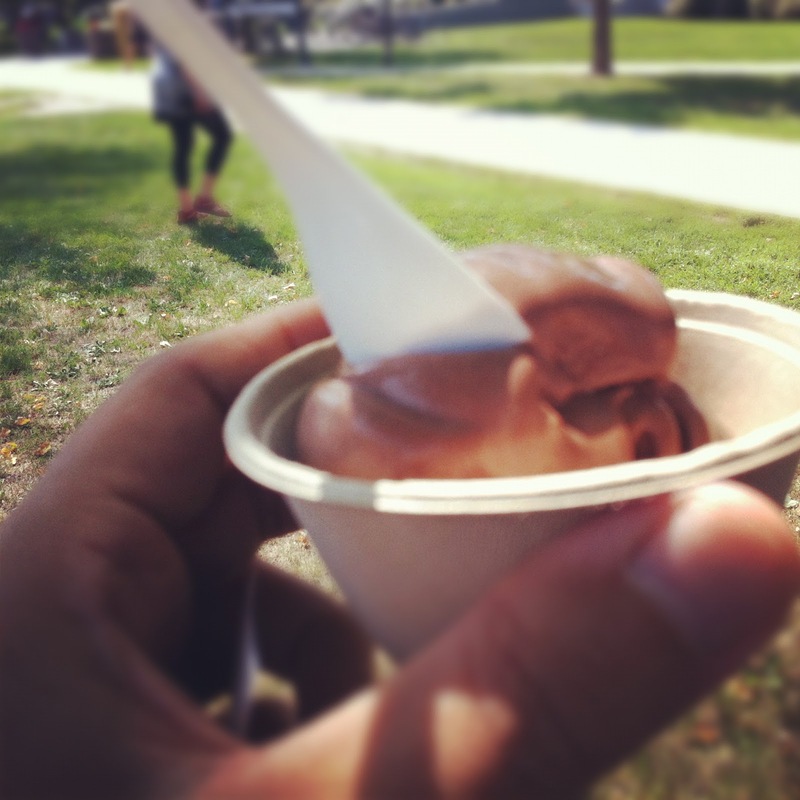 Today frozen custard is available throughout the US, but is almost unknown in Canada. 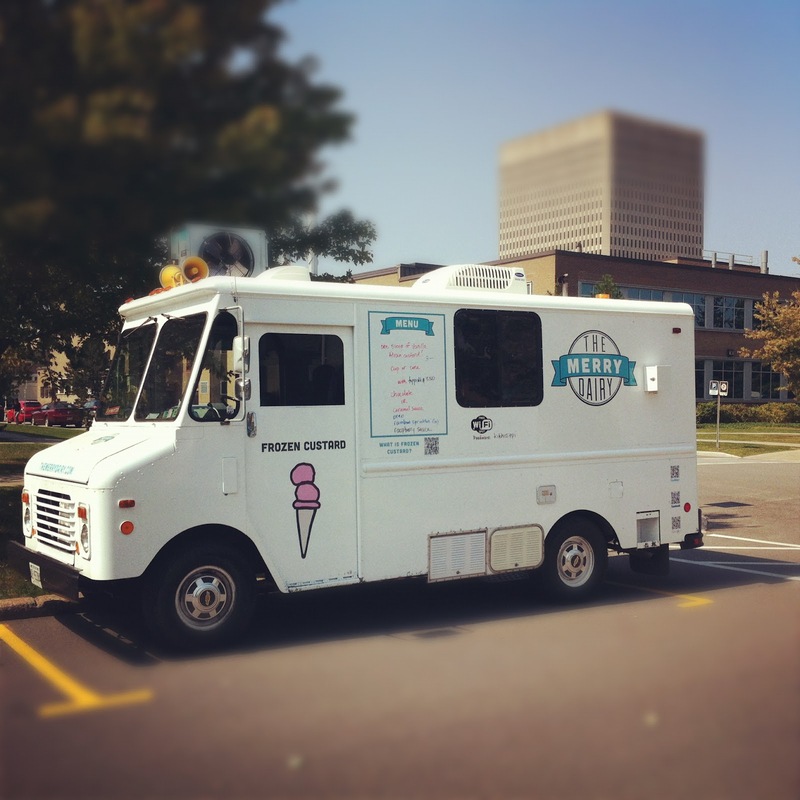 Thankfully, The Merry Dairy is bringing this delicious ice cream to the Ottawa masses. Made fresh daily, hand scooped and sold from a truck, its uniqueness comes both from the quality of ingredients (cream, sugar and pasteurized egg yolk) and the machine that makes it. I can attest to its deliciousness. The menu is simple. Chocolate or vanilla custard served up in a cone or a cup and topped (for a little bit extra coin) with your choice of toppings (chocolate, caramel, strawberry or raspberry sauce, Oreo crumbs, dutch chocolate or rainbow sprinkles). I chose the chocolate custard and xnayed the toppings. I promise to be a little bit more adventurous next time up but I wanted to savour the full flavour of the custard without any distractions, however tasty. Part of the fun and excitement of Merry Dairy is that it’s a moving target. Here today, gone a little later today and not to reappear for a week or so. An easy way to keep track of the truck is to follow it on Twitter. 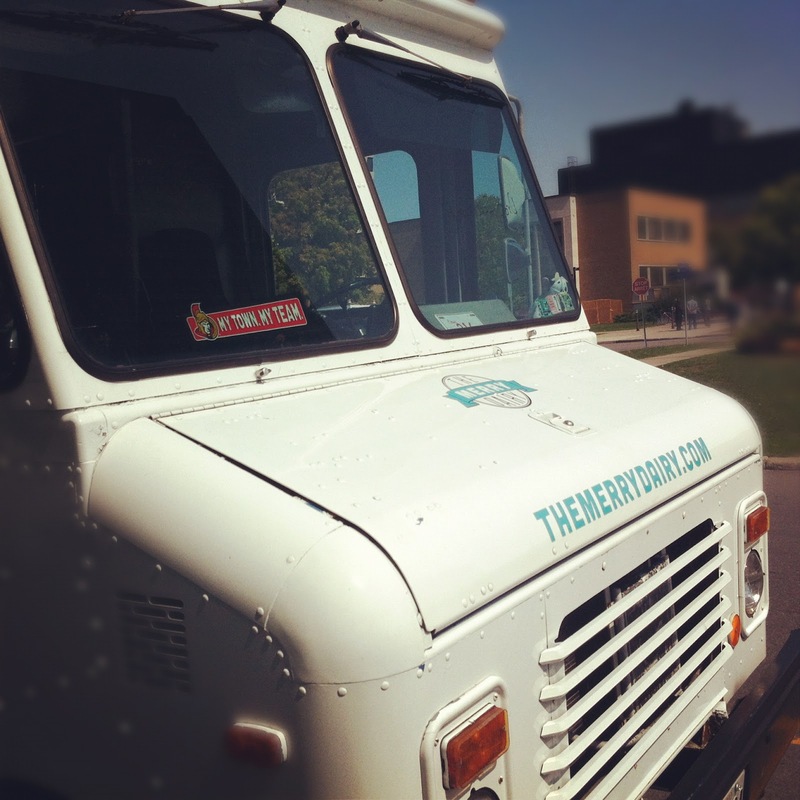 Check out the upcoming schedule to learn when the truck will be in your neck of the woods. I don’t have any inside deets but I can’t imagine that Merry Dairy will be with us for much longer. As summer turns to fall and fall turns into frozen tundra, I would suggest that it’s best to catch The MD while you can. Carpe Diem and get your frozen custard. The 7-year-old in you won’t regret it. ← Lunch at Allium signals the end of "Birthday Month"